Yamaha is the leading guitar and piano producers in the world. In some parts of the world, the company is well known for its motorcycles, snowmobiles, and boats. However, in Japan, other than the vehicles it is known for, the company controls the music industry. For over sixty years, Yamaha has been known for the quality of musical instruments it produces. Such a long period of existence has enabled the company together enough skills and to acquire the required experience to make it a market leader. One of its popular guitars is the Yamaha F335 Acoustic Guitar. At an average price of under $200, this is one of the most budget-friendly guitars on the market. It is the best product you can get within its price range. It is thus a good entry level guitar that learners should prefer as they seek to climb the ladder into professionalism. Many professionals today started with this guitar or used it at some point during their take-off years. It is for this reason that you still find many professionals still recommending the guitar for the beginner guitarists. 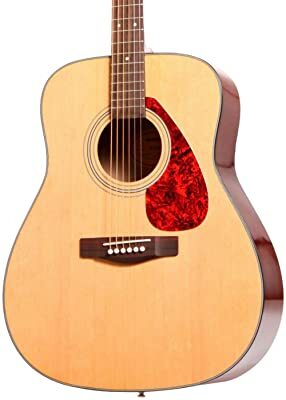 All in all, whether you are a beginner or a pro, the Yamaha F335 Acoustic Guitar is the cheapest you should ever consider going for. Since it is a budget guitar, you only expect to get what you pay for. Such low-budget devices will come with some less superior construction features when compared with the premium models. This is not, however, to mean that it is totally inferior. In fact, in many instances, it may serve you as long as some other premium products. Nevertheless, it’s a solid guitar coming with a very sturdy spruce top that isn’t very porous. Its sides feature the cheap Meranti wood that happens to give an almost plastic feel thus making it a bit unpleasant to some guitarists, especially when the instrument digs into their stomachs as they are drumming the chords. This is probably the weakest point of the Yamaha F335 Acoustic Guitar. It features a laminate that makes the wood to have an almost unreal feel. The less superior wood used in the construction has been compensated with a massive laminate which in turn gives the product a plastic feel. Although this is not the best product on the market, make a comparison with any other product within its range and you will come to appreciate the guitar as being the very best for a budget buyer. The main color of the Yamaha F335 Acoustic Guitar is the natural, slightly aged color. However, there are a number of other options available for you to choose from. These include the tobacco brown sunburst that presents an old-school look. Others are the solid color that gives the guitar a lustful aura among others. The availability of a number of colors to choose from increases the chances that you will end up with a product you love as far as elegance is concerned. The black colored guitar is the most sought after of all the available colors. Though laminated wood is known to have a different sound feel from the original wood, this product is given credit for producing a sound almost akin to that of real wood. One can play notes on this guitar but there is a limitation in that the player will be hard pressed to distinguish between the different notes. The main performance quality that comes with the guitar is its rather pleasant feel that stays in tune, very fun to play and above all, a decent consistency. All customers who were looking for a beginner guitar were impressed by the performance of this musical instrument. A few of those giving it low ratings are those who had not researched to understand the product before going for it. Some customers have appreciated playing the guitar in some small school bands with others giving it thumbs high for coming handy in small venues. Beginners who are still on tight budgets are also pleased with such an impressive design at its price. In fact, it is the ratio between the meager price of the guitar and its acceptable quality that makes it popular. Needless to say, professional guitarists view this guitar as a perfect toy guitar for the newbie. Though the feel is commendable to such pros, the audio and sustain quality are unacceptable to such. In a nutshell, the Yamaha F335 Acoustic Guitar is an outstanding entry level guitar. It is highly recommended for the newbie. However, if you are a pro in the game, you may need to save a bit more and go for the higher end, better quality guitars. The Yamaha F335 Acoustic Guitar isn’t the best guitar on the market as there are others that top its quality. However, as far as the price to quality/performance ratio is concerned, the guitar comes among the tops. It is the best product within its price range, coming with a number of color options for the user to choose from. Its black color option is the most sought after. It is the perfect product for the beginner guitarist who is just starting to make real their quest of rocking and rolling. In other words, though it is not the perfect guitar you may want, it is equally far from bad.